The kids often come home from school and tell me about the really good food that they eat in the cafeteria and could I make that too. 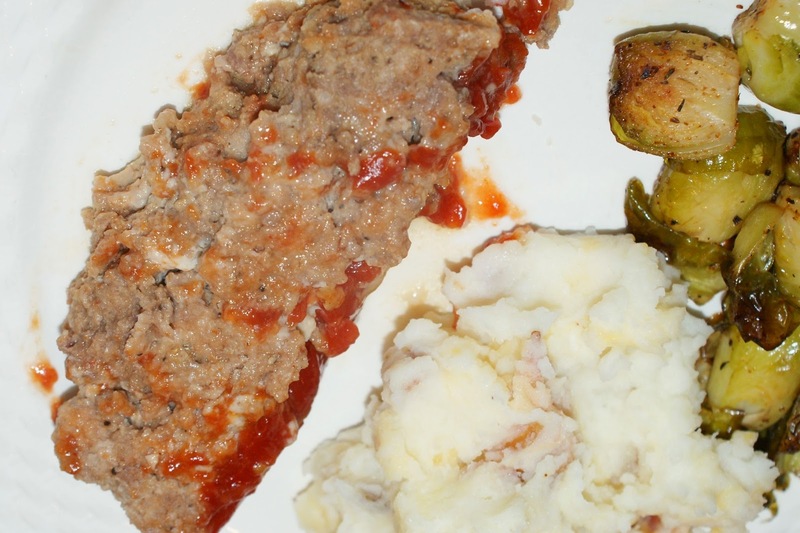 I haven’t found a good recipe for sloppy joes but I did try this meatloaf (to great success and accolades). Yea me! Heat the olive oil in a medium saute pan. Add the onions, thyme, salt, and pepper and cook over medium-low heat, stirring occasionally, for 8 to 10 minutes, until the onions are translucent but not brown. (Or simply add 3 T onion powder to the following mixture of ingredients). Off the heat, add the Worcestershire sauce, chicken stock, and tomato paste. Allow to cool slightly. In a large bowl, combine the ground meat(s), onion mixture, bread crumbs, and eggs, and mix lightly with a fork. Don't mash or the meat loaf will be dense. Shape the mixture into a rectangular loaf on a sheet pan covered with parchment paper (or I put the meat mixture in a loaf pan). Spread the ketchup evenly on top. Bake for 1 to 1 1/4 hours, until the internal temperature is 160 degrees F and the meat loaf is cooked through. Serve hot. That's such a great flavourful sounding meat loaf. Very inviting.